Ionium 2 – Ionic Multipurpose App with Ionic 3 Created by ionicpremium. This templates have specific characteristics, namely: Ionium has features such as Software Version: iOS 10.0.x, iOS 9.0.x, Android 6.0, Android 5.1.x, Android 5.0, Android 4.4.x . You can use this Ionium 2 – Ionic Multipurpose App with Ionic 3 on Mobile category for crud, crud using ionic 2, ionic 2, ionic 2 template, ionic 3, ionic firebase, ionic mysql, ionic native, mobile native web app, push notification, sass, ui components and another uses. 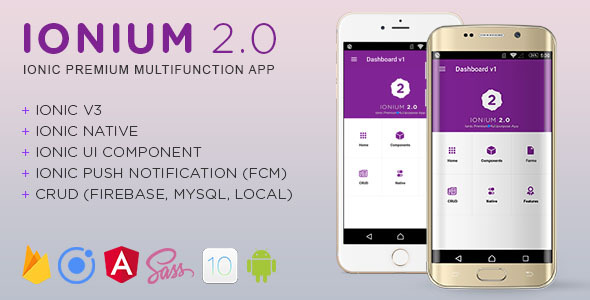 Ionium 2 is an Ionic Multipurpose App for Android and iOS. It used Ionic 3 and cordova plugins. This app will help you in developing hybrid apps for Android and iOS. You can easily implement components source code from Ionium 2 by following our well organized documentation and follow the video tutorial. Try first before you buy, check our demo app on playstore. Built with Ionic 3. Develop your mobile web app front-end fast as lightning! Accordion Menu. Beautify your sidemenu with icon and beautiful accordion. Ionic Native. 13 native Cordova/PhoneGap plugins that make adding any native functionality you need to your Ionic mobile app easy. Form Components. Include checkbox, datetime, select, radio, toggle and range input. Create, Read, Update, Delete. A very simple note app to demonstrate you how to use CRUD in Ionic 3 using Firebase, MySQL and Local Storage. Special Features. We also include infinite scroll, pull-to-refresh and google map. Tested on Sony Xperia Z1. Every UI element and layout work on Android 4.4 and up to latest Android version. We tested it on Sony Xperia Z1 (Android 5.1). And everything works perfect. SASS (Syntactically Awesome Style Sheets) ready. With SASS you can fast customize our themes or even make new.